Walt Disney Studios logo with Mickey Director over name, 2) Stitch with rays, 3) Tinkerbelle sitting. 1) Fozzy Bear, 2) Kirmit, 3) Miss Piggie. 1) Donald & Parrot, 2) Pluto, 3) Chip with clap board, 4) Movie Director Mickey, 5) Mickey & Pluto, 6) Sorcerer Apprentice Mickey, 7) Mickey with Fantasmic Dragon, 8) Minnie with Boa. Hollywood Blvd, Oscar s Super Service. 1) Kylo Ren, 2) R2-D2, 3) Yoda. 1) Snow White 1 of 8, 2) Bashful 8 of 8, 3) Doc 4 of 8, 4) Dopey 3 of 8, 5) Grumpy 2 of 8, 6) Happy5 of 8, 7) Sleepy 6 of 8, 8) Sneezy 7 of 8. 1) Hollywood Tower Hotel logo, 2) Bellhop Goofy, 3) Bellhop Stitch. C) Retired Prop Shop 2: 1) Randall Boggs 3 of 6 (Monsters Inc.), 2) Big Blue House Bear 1 of 7, 3) Boo 4 of 6 (Monsters Inc.), Big Blue House Pip and Pop of Bear 3 of 7. D) Retired Sorcerer s Hat Shop: 1) Tutter of Big Blue House 6 of 7, 2) Celia 6 of 6 (Monsters Inc.), 3) Henry J. Waternoose 5 of 6 (Monsters Inc.); 4) Shadow of Bear in the Big Blue House 7 of 7. F) Retired Star Tours: All say Star Tours": 1) Mickey as Luke Skywalker, 2) Minnie as Princess Lehi, 3) Goofy as Darth Vader. I) Retired Celebrity 5 & 10: 1) Roger Rabbit; 2) Lady and the Tramp (3 of 6); 3) Dancing Baloo (Jungle Book 3 of 6). K) Retired Mickey s of Hollywood #3: 1) Mickey & Camera Walt Disney Studio logo, 2) Tower of Terror, 3) Mickey Mouse as artist. 1) From Disney s In Character Costume Shop, Cinderella . 4) Mickey Mouse in profile carrying movie camera. 11/14: The Magic of Disney Animation (2014) machine has new designs, Big Hero 6 Disney movie set. The Wreck It Ralph set 1 & 2 were moved . 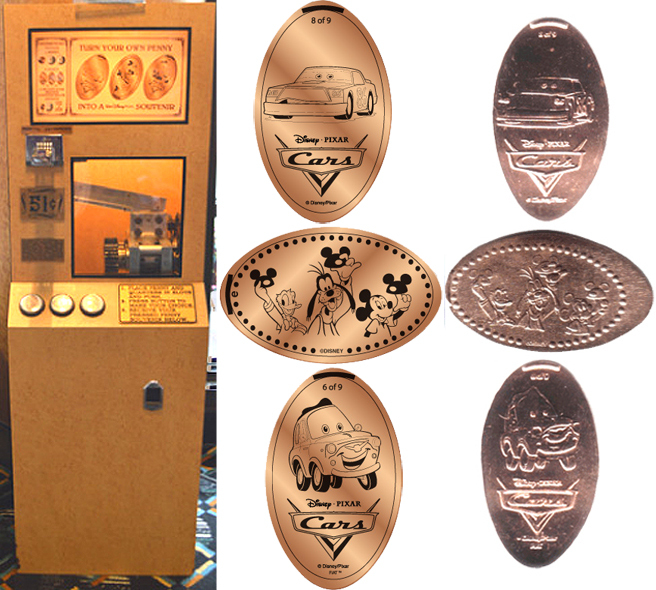 1/16: New Tower of Terror penny machine added. 7/07/16: new Frozen Show Store 8 penny machine added (Scan at bottom). 11/21/16: Animation Courtyard, (2016) next to Launch Bay, Star Wars 8 penny machine added here.